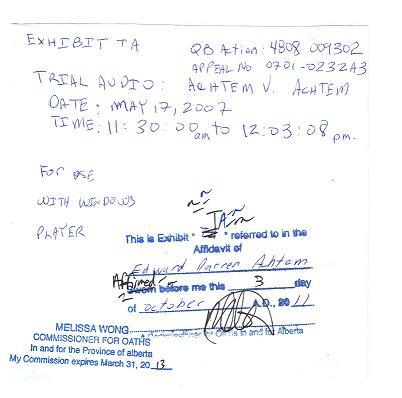 EXHIBITS: EXHIBIT TA - Trial Audio Time: 11:29:50 a.m. to 12:03:09 a.m. May 17, 2007. EXHIBIT TA - Trial Audio Time: 11:29:50 a.m. to 12:03:09 a.m. May 17, 2007. Trial Audio - 2nd Climax time: 11:43:32 a.m. to 12:03:08 p.m.